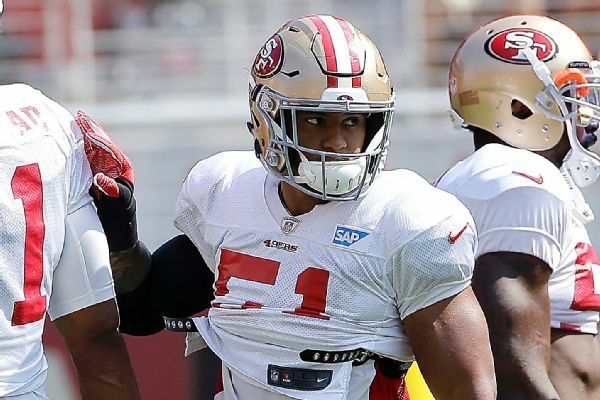 SANTA CLARA, Calif. -- San Francisco 49ers coach Kyle Shanahan's fears about Malcolm Smith's pectoral injury were confirmed Saturday, when an MRI revealed a tear that could end the linebacker's season before it gets started. Smith suffered the injury during practice Saturday at Levi's Stadium. Moments after that workout, Shanahan suggested that Smith would miss an extended period of time but had expressed hope that he might be able to play this season. Those hopes were dashed after an MRI showed that Smith suffered a torn pectoral, the team confirmed Saturday night. On Monday, the 49ers placed Smith on the injured reserve list and signed linebacker Austin Calitro. "That would be a big one for us," NaVorro Bowman said Saturday about potentially losing Smith, "just because we've been getting so many reps together, jelling together and really talking about what the offense is trying to do to us throughout these OTAs and training camp. So that would be a loss, but it's early. We have other guys that I feel like can play at this level also. Let's hope not. Let's hope he's able to overcome this and get him back pretty soon." Smith suffered the injury about midway through Saturday's practice as he chased down running back Matt Breida near the sideline. Smith reached for the ball and let out a groan as he appeared to get his arm caught on Breida's helmet. Smith attempted to stay in but had to leave the field soon after. Smith's injury is a tough blow to the Niners' defense after San Francisco made him a free-agent priority in March. He signed a five-year, $26.5 million deal in part because of his familiarity with new coordinator Robert Saleh's defensive scheme. The MVP of Super Bowl XLVIII, Smith came to the 49ers from the Oakland Raiders but had previously worked with Saleh when they were with the Seattle Seahawks. During the opening week of camp, Smith worked as the starting weakside linebacker and was expected to battle with rookie Reuben Foster for that role throughout the preseason. Earlier this week, Saleh insisted that the 49ers didn't want to rush Foster, who is coming off shoulder surgery, into the starting lineup. "He has a lot of flash plays," Saleh said. "The best way I can explain with Reuben is he'll get his opportunity when he absolutely, absolutely deserves it. The credit really goes to the 'backers in that room also -- that they also deserve every opportunity that they're getting as well as him. As a group, we're just trying to work through it and make sure that we do our best to evaluate and give them all an equal opportunity to be evaluated." When Smith left Saturday's practice, Ray-Ray Armstrongreplaced him with the top defense, but Foster's ascension up the depth chart could be expedited following Smith's injury.